Find My Workspace lists over 95% of the serviced offices market in Brisbane - West. Simply click Request Quote to check pricing for one office, or Add to Basket for multiple offices. 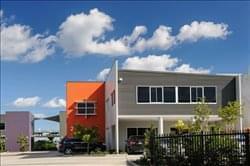 A well located commercial office space in a Business Service Estate at Seventeen Mile Rocks, Brisbane. Ideal for small business owners or professional looking for a corporate level office fitout. Naturally lit offices are on offer, as they all have external windows, and range from 11.75 square metres up to 35 square metres with flexible tenancy periods available. The premises are very secure providing full video surveillance, monitored alarm system, individually lockable offices all within a security gated complex. The amenities provided include free high speed internet connection, shared kitchen and bathroom facilities, full use of VOIP phone systems with handset hardware, and each office comes with at least one off-street allocated car park. To obtain information for your selected Brisbane - West Serviced Offices, please tick the "Add to basket" box for each office you prefer and complete the form below. We will then send a detailed report via email.